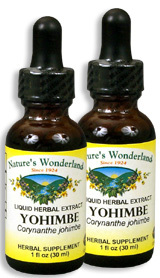 Yohimbe Extract, 1 fl oz / 30 ml each (Nature's Wonderland) - Penn Herb Co. Ltd.
Yohimbe is the legendary libido booster for increased energy, arousal and satisfaction. The sensual stimulant improves blood flow to the genital area for maximum pleasure and performance! Add our fast-absorbing liquid extract in a few drops of water or juice when you need it. In some African cultures, Yohimbe remains a part of the local tribal marriage and mating rituals. Feel the full power of this traditional herb for yourself experience newfound desire and achieve peak performance. NOTE: Yohimbe's active ingredient, yohimbine may affect blood pressure and heart health. For effective alternatives, see the herbs Muira Puama, Maca, Damiana and Epimedium. AMOUNT PER SERVING (333mg/ml or 30 drops): Selectively Imported Yohimbe Bark (Coryanthe johimbe). OTHER INGREDIENTS: Grain Alcohol (55-65% by volume), Deionized Water. Free of: milk, dairy, egg, fish, shellfish, tree nuts, peanuts, wheat, gluten or soy. Maintains healthy performance and satisfaction; promotes blood flow and circulation. 15-30 drops in water or juice, 2-3 times daily or as needed. NOTE: Herbalists do not recommend Yohimbe for long term use, or in case of chronic inflammation of the sexual organs or prostate.